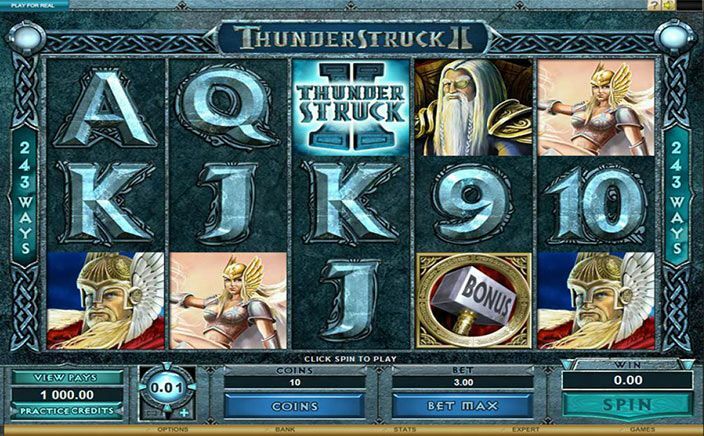 Thunderstruck II slots was released as a successor to the classic Thunderstruck slots game. It was released in 2010 and since then it has gone to become one of the most popular slots out there. The slot is based on Norse Mythological elements and has some really great bonus features such as the Great Hall of Spins feature and Wildstorm feature. Microgaming is one of the largest slot game developers in the world. The company is privately owned and is based out of Isle of Man in the British Isles. Thunderstruck II slots is 5 reels and 243 paylines game. The slots game can be played for as low as 20p per spin to as much as £15 per spin. It is extremely cheap on the wallet and thus is one of the reasons why it is so popular all over the world. The slot has a very manageable variability. The wins are spread evenly throughout the game and you need not wait for long to land a winning payline. Also, the jackpot of 1000 coins will keep you engaged in the slot game for quite some time. As far as the bonus features go, Thunderstruck II slots have two of them. • Great Hall of Spins feature – This feature is triggered by landing 3 or more of the scatter symbols on the reels. The feature is divided into four different levels for the four main characters of the Nordic legends. The Valkyrie, Loki, Thor and Odin. In the first level, you get 10 free spins, 15 in the second, 20 in the third and 25 in the fourth. All the levels are progressive and once you reach fourth level you can choose to play whichever level you desire. Also, each different level as a different extra bonus to offer making the feature far more exciting. • Wildstorm feature – This is a randomly triggered bonus where you get 1 free spin. But not only that. 1 or even 5 of the reels may turn wild resulting in a win more often than not, most likely a big one. 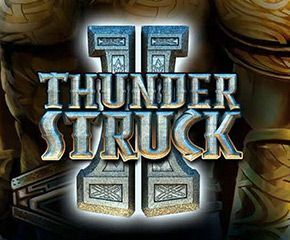 Thunderstruck II slots also have a wild feature in the form of the game logo itself. This is quite useful as it acts as a substitute for all the other symbols except the scatter. Thunderstruck II slots definitely is worth all the hype surrounding it. The slots game has everything in the right amounts to make it a perfect slot game full of fun and excitement.